This article is written for the feature-length or short-film screenwriter who wants to understand the screenplay format and/or cannot afford Final Draft but has access to a word processing application like Microsoft Word, Pages, etc. If you’re writing screenplays and making a living from them, I highly recommend Final Draft . Once you learn the basics and shortcuts, the program gets out of the way and allows you to focus completely on your craft. I started out with Microsoft Word and then bought Final Cut Draft later. It’s worth it. For a free software that works great, take a look at Celtx. It works for Windows, Macs and Linux. However, you might have to pay extra ($14.99) for index cards, etc. They all work great, and I used MS Word for six years without any problems. The only two ‘must-haves’ for a serious screenplay writer are a great keyboard and a great chair . Even if you’re writing on a tablet, get a bluetooth keyboard and pound away. Which screenplay format should you follow? If you’re sending your script to a competition or service: Follow their guidelines strictly. If you’re pitching your script to a studio or agent: Follow their guidelines strictly. If you’re writing scripts on spec: Follow the Nicholl (this article) system. If you’re already a successful writer: Do whatever you want, nobody cares. It allows you to stop worrying about formatting and concentrate on your screenplay. It helps others to skim through your script faster. It forces you to think in terms of scenes, actions, transitions and dialogues. It lets you time your screenplay – one page is roughly one minute of screen time. These are the reasons you should study and stick to one kind of formatting. Otherwise you’ll always be formatting. I chose to follow the the Nicholl format, and this article follows that. BRADS — (Acco brand) No. 6 round head fasteners / 1.5 inches. This length works well on most scripts. For a thin script, you might use 1.25 inch brad (#5). You do not want to go longer as 2+ inch brads are universally known as “killers” for their propensity to stab readers and other humans. …do not permanently or semi-permanently bind your script. Good scripts need to be copied. Bad ones do not. The font is Courier 12-point 10-pitch. What’s the meaning of point and pitch? Pitch refers to the number of characters per inch horizontally. E.g, one line on A4 can hold 57 characters, while one line on US Letter can hold 60 characters. Courier is a font in which every character uses the same width. One point (in font terms) = 0.3528 mm (0.014″). How many lines should you have? As a rule of thumb, 55 lines makes the ‘one page = one minute of screen time” work. How is A4 different from US Letter? You might be wondering if there are any practical ramifications of using A4 over the standard US Letter format. If you’re sending a web PDF document, then consider where it will be printed. If it is going to the US, then it will be printed on US Letter, for example. Courier 12-point should give you 4.23mm (0.166″) per line. For A4 paper, this means 55-64 lines , and for US Letter paper, this means a maximum of 51-60 lines. How many characters does that make? A4 – Between 3,135 to 3,648 per page. Letter – Between 3,060 to 3,600 per page. That’s an approximate difference of 2% between the two. If one page equals one minute (60 seconds) in US Letter, it would mean 61 seconds on A4. For a 100 page script, it would approximate 100 minutes in US Letter, and 102 minutes in A4. There is no difference. Also, don’t forget to take note that you are allowed to use double or even triple spaces between lines, or break up your page breaks for better readability. This by itself is a 10% difference per page! To recap, don’t worry about the paper size. Stick to the margins, and keep your font fixed at Courier 12-point 10-pitch. Where do you find Courier 12 pt 10-pitch? The easiest way is to download a demo version of Final Draft. Then copy the font to your font directory before the trial version expires. Then you’ll have it available for Microsoft Word or another word processing application. Before you use fonts, make sure there are no licensing fees involved. Some fonts are not usable for any purpose, commercial or personal. When in doubt, use the default Courier font on your word processor. Nothing bad will happen. I’m going to be using Microsoft Word, but you can do the same with any word processor. Open a new blank document. 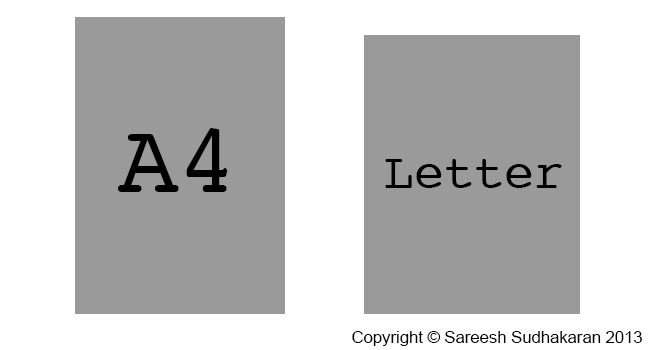 Go to Layout and choose the paper size – stick to US Letter or A4. Click OK. Go to Insert > Page Numbers and select Top and Right. Page numbers should be displayed from the first page. Note: Some people shift the page numbers a bit to the right but it doesn’t matter. Start the numbering from 2 (1 is reserved for the title page). Finally, select the Courier 12pt font. That’s it, your main document is ready. Save it on your hard drive before proceeding. We’ll come back to it after the next section. Create your title page only after you’ve finished writing your script. Otherwise you might spend months with just the name of your movie! 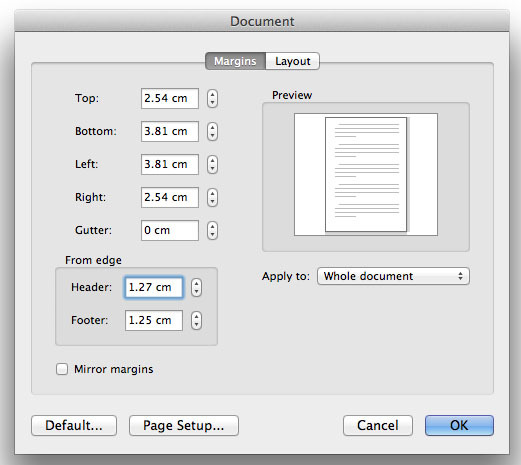 Open a new Word document and select the same paper size as your preferred screenplay format. Choose your font. The title is centered somewhere just above the middle (doesn’t matter). On the next line (or you could leave a couple of lines) you write ‘by’. On the next line write your full name (only first letter is capitalized). No jazzy stuff, bold fonts or styles or colors. The page number shouldn’t be visible on the title page. On the bottom right (align to the right), write down your address, phone number and/or email address (Many competitions forbid you to include this information). Nobody’s going to study your title page and gush at your layout skills. It shouldn’t draw attention to itself. If your script is good, then the reader will want to meet you. Save this as a title template and you’re done. In Part Two we’ll look at formatting the elements of the screenplay and also look at how you can make writing more fun. Many many thanks. This is very useful. very helpful! easy to follow as well.